Maryland Shingle offers a full line of attic ventilation products available for installation on your home. Most products can be easily installed when you re-roof your home. Attic ventilation, is it really that important? Yes, effective attic ventilation can help eliminate excessive heat and humidity that can build up in your attic. Excessive heat and humidity can cause a host of problems such as ice dams, premature shingle failure, lower insulating R-values, higher energy bills and many other problems. To help avoid these problems you may want to consider installing some type of attic ventilation system on your new roof. One of the best systems for ventilating the heat and humidity from your attic is to install a roof ridge vent. This system is designed to work in conjunction with under eave soffit ventilation. If your home lacks soffits ventilation or the soffit area is solid (non venting) you will want to have a qualified contractor install some type of soffit ventilation. Be aware that some roof ventilation configurations may require special consideration and recommendations to perform properly. Ridge vent works best when used in a balanced attic ventilation system. This requires the volume of air intake (such as under eave vent) to match or exceed the volume of air exhaust (such as ridge vent). 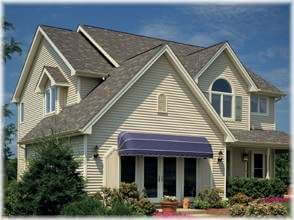 Ridge vent is also is available in many different configurations and colors to compliment your new roofing. Maryland Shingle recommends Air Vent products as one of the best makers in our opinion. Air Vent ridge vents feature external wind baffles to protect against water infiltration while creating negative pressure to help pull air out of your attic. Air Vent also offers shingle over ridge vents such as Shingle Vent II with internal weather filters. If you are considering ridge vent, Air Vent should be on your short list. Attic fans are also another popular choice for attic ventilation. If you are considering a power roof mounted attic fan, we strongly recommend selecting one that comes equipped with a humidistat such as the Power Cool Plus by Air Vent. A humidistat has the ability to engage the fan not only when the attic reaches a certain temperature but also when and if the attic reaches a certain moisture level. This can be key in colder months when the temperature is low but the humidity in your attic is on the rise. Warm moist attics in winter months contribute to many problems not the least of which is the formation of ice dams. Proper attic ventilation in combination with snow and ice shield underlayment are a good choice when considering re-roofing your home. For more information and a free no obligation roofing assessment on your home call Maryland Shingle Roofing & Siding Contractors!